I missed the "Bready Things" theme a few weeks ago at I Heart Cooking Clubs so I'm bringing this open-faced sandwich from Hugh Fearnley-Whittingstall to this week's Potluck. 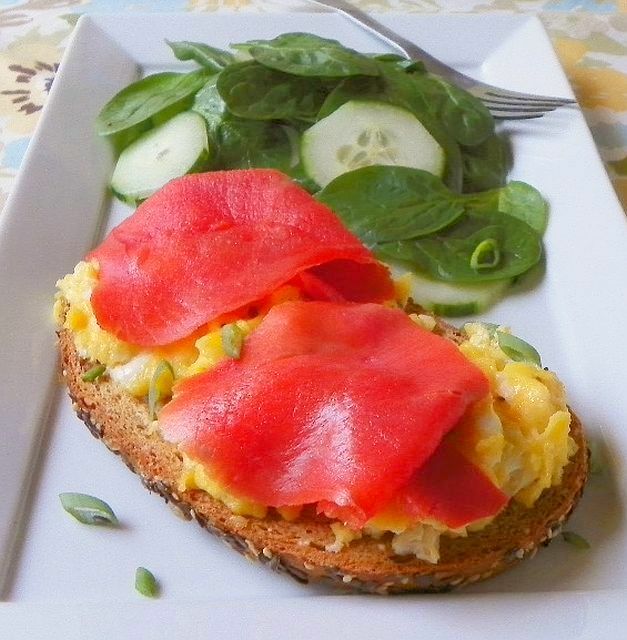 Comprising scrambled eggs and smoked salmon piled high on a slice of toasted sourdough - yes, it really is that simple - I don't know that I actually needed a recipe for this but I did need a reminder of how good it is. The recipe is in the breakfast chapter of Hugh's book River Cottage Every Day but with a side salad it makes a delicious light lunch or supper too. Visit here to see what everyone else brought to the potluck. This is a brilliant idea to put eggs together with salmon. Beautiful to look at too! I adore stuff on toast, and I will certainly help myself to seconds at any pot luck! I've noticed that a lot of his "recipes" are more ideas for something - many good ones,like this, which sounds like an excellent breakfast, or lunch. Ahh! The perfect light lunch. Fit for a queen! Lentil and Squash Pasties - IHCC Pub Grub! Honey Whole Wheat Cake - IHCC Hit the Sweet Spot!